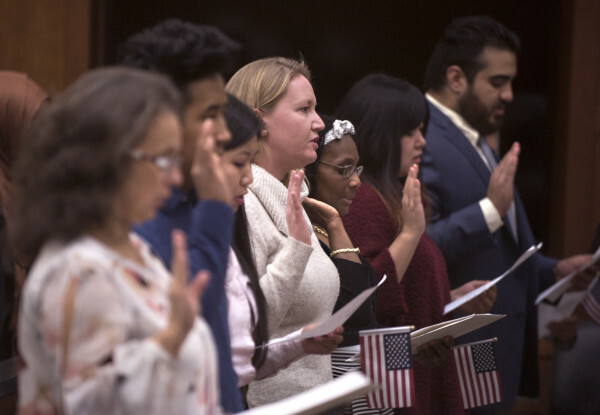 People take the Oath of Allegiance during a naturalization ceremony at the Margaret Chase Smith Federal Building in Bangor, Nov. 21, 2016. PORTLAND, Maine — Maine’s population this year hit the highest point since 2010, entirely because of newcomers from other parts of the country and the world, new estimates show. Deaths continued to outpace births in the state, but an estimated 4,000 newcomers offset the decrease to put the state’s population up by about 2,000 in the past year. That turnaround, which began in 2014 , saw Maine gain a net of about 2,200 people from other states and about 1,800 people from other countries in the past year. All that migration into Maine offset a natural population decline, with 1,300 more deaths than births. Maine and West Virginia remained the only states where deaths are outpacing births. The influx helped chip away at a trend of people moving away from Maine since the 2010 census. Since that year, demographers project the state has had a net loss of about 2,000 residents who moved away to other states. The latest estimate released Tuesday puts Maine’s population at 1,331,479, up from 1,329,453 in 2015. The release does not include county-level estimates of population change, but data through 2015 shows growth concentrated in York and Cumberland counties. For example, estimates for those years show towns such as Freeport, Yarmouth, Kittery and Wells overtaking larger northern areas such as Presque Isle and Caribou. The Census Bureau reported Maine and New Mexico reversed estimated population losses in 2015. Eight states had estimated declines, including Pennsylvania, New York and Wyoming. Utah, Idaho, Florida and Washington were estimated as the country’s fastest growing states. The Northeast was the country’s slowest growing region, with its population basically stagnant.